Tough enough for long trips but won't weigh you down on your commute, the Marathon has gained an excellent reputation as a reliable tire for worry free touring and city riding. This tire is hands down that best tire for commuting. My tire size is 700c x 47mm on a 29er MTB. I don't worry about road debris, holes or gravel. I ride them at 50psi for a more comfy ride and they corner well. It's a nice wide tire with no show of any wear. I have these tires on the bike that I use for commuting to work. One third of the commute is on hard pack dirt trail through wooded forest preserve and these tires have performed well in terms of grip and durability. They also ride quite smoothly on the pavement - not like the 700c x 23 tires on my road bike, but still nice. Tread offers decent water shedding in the wet. I would buy these again. Well made, sturdy, comfortable, and daily fast. Bought them for a 2500 mile tour but using them here in Key West where the road surface is terrible. They are holding up well to the punishment of the coral stone. Nice ride. So far almost 500 miles on these tires and they've been great. Previous tires were getting flats on a regular basis due to shards of shale. These just keep rolling on. I did a tough ride on an old railroad road bed which had about ten miles of the old coarse rail ballast still exposed with some fines to fill it in. That was ten miles of possible pinch flats, punctures, and kicking my tires off track. I was worried about punctures but the Schwalbe's laughed it off. I'm sold. great tires. responsive on turns. Easy rolling and traction when you need it. The tire compound on this just feels tougher and better manufactured than any other tire. Frankly any other tire feels flimsy and cheap. They feel good on forest paths also but loose rocks have a hard time. Combined with great cust service from BT direct, these are an excellent buy. Don't forget tire levers to put them on. I have been commuting on Schwalbe Marathons since 2012 and have had two punctures during that time. They are a little heavy, however, the trade off with a puncture free commute is worth it. During that time I also did a 1,000 mile tour with no punctures. Fit on 29er rims, roll well on asphalt. Love the reflective sidewalls. I use these to ride on asphalt and sidewalks with occasional gravel. They don't have great traction in mud, but that's to be expected with the tread design when pumped up to the higher pressure rating. Overall, seem good for touring with roads and paved trail. I've only ridden 150mi on them, but absolutely no complaints so far. I bought these tires to put on a gravel bike I built. I want to start by saying these tires have a lot going for them. They roll incredibly well for 32MM tires. I have ridden them on a variety of surfaces and they hook up great. Everything from asphalt, to grass, to gravel, to boulder strewn jeep trails, to hard pack dirt. They took a pounding over about 500 miles during my 3 week vacation in the Colorado Rockies and they show no wear, cuts or abrasions. The critical flaw is that the front tire is out of round. I mounted them before I went on my vacation and rode them for about 100 miles on the paths around New Orleans. The front tire has a very pronounced thump, thump, thump as it rotates. I put the bike in my stand, spun the tire and lowered a straight edge to the tire. That really made the bad spot stand out. There would be plenty of clearance throughout most of the tire's rotation then about an inch of the tire would rub. Had the tire not been defective, I would have given 5 stars. I ride a set of 700 x 35's, mounted on a touring bike, across paved trails, road shoulders, grass and gravel. After 500 miles, no flats, smooth ride, only 1 needed re-inflation. I am a t7 para and I use a wheelchair. I also ride a handcycle. I have schwalbe tires on all my bikes and wheelchairs. 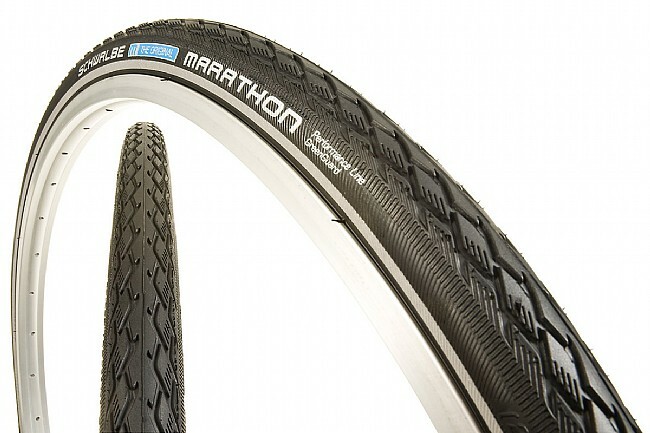 I need the best flat protection possible and I feel that is what I get with schwalbe marathon tires. I have these on my Trek 7.3fx bike that I use daily to commute to work. I ride over potholes, gravel and all sorts of miscellaneous junk and have NEVER had a flat. After 2,200 miles there is almost no visible wear. I have a level of trust in these tires I never before thought possible. In addition to commuting, I put in longer rides some evenings and most weekends and will say these tires also roll pretty easy. They would not be my first choice for fast club rides, but they are not really meant to be a racing or training tire. They are my first choice for 50 and 100 mile charity rides. They will not let you down. Ive had the tires for a few weeks with no flats so far. Live in the middle of goat head country. Arrived quickly after ordering. Purchased on sale and it was worth it. Very good tire which I purchased to stop getting flats from blackberry thorns. The stock tires that came with the bike from BikesDirect were cheap 35c Continental mud tires and replacement was overdue. I commute to work every day and need a tire that resists punctures and provides good traction. The Marathon does both. Since switching to this tire, I have not had a single flat, riding over urban streets with the usual assortment of glass, puncture vines, screws, nails, etc. Great commuter tires at a good price. I use these tires for an 18 mile round-trip commute. They're great dependable tires for commuting. I don't know why you would look further for a commutingtouring tire. I Can Ride in Tucson Without Getting a Flat. A tough yet efficient tire. I have ridden many tires in the past few years that I have picked up on cycling. None of them have been as quick rolling, comfortable, or trustworthy as these 700x35 Marathons. I took them out on a nasty ride here near Woodland Park, Colorado. Pavement, cracked pavement, a little chipseal, gravel, pea gravel, mud, snow, rocks, a climb with 1700 feet gain in 4 miles, washboard, only to be surprised that these tires handled everything with confidence and speed. Despite the weight and bulk in these tires, they are fast. I even scored a new record on a 400 foot climb that I have ridden for nearly 2 years. Don't overthink it guys and gals, get this tire if your bicycle has the clearance!